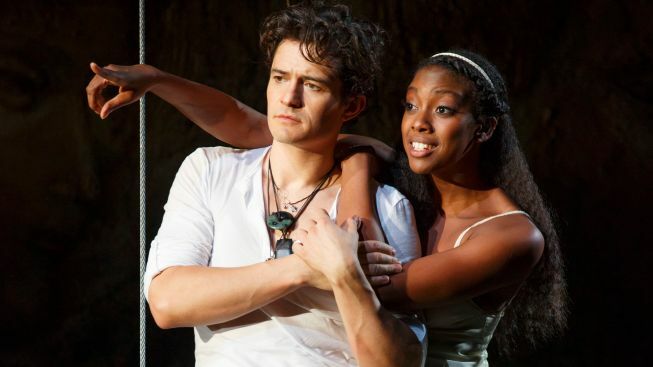 Review: Orlando Bloom, Condola Rashad Play With Fire in "Romeo and Juliet"
Star-crossed lovers: Orlando Bloom and Condola Rashad in "Romeo and Juliet," directed by David Leveaux. Heat also radiates into the orchestra seating, from tight coils of live flame -- fire, contained in steel tubes -- that punctuate many scenes, among them a festive costume party thrown by Lord and Lady Capulet. Director Leveaux (“Nine”) has time-shifted the familiar tragedy to the modern day, and distinguished the Montague and Capulet families by race. We’re never sure quite where in the world his Verona is, but it’s clearly an affluent community, and everyone speaks in Shakespeare’s original language. It also must be near a beach, because mounds of sand are piled in the wings. Some text has been trimmed to bring the production in at two-and-a-half hours. The opening scene, pitting rival cousins Benvolio (Conrad Kemp) and Tybalt (Corey Hawkins) against one another in front of a graffiti-marked wall, could well introduce the contemporary “West Side Story.” An engine revs offstage, and a helmet-clad rider storms in on a Triumph Scrambler motorcycle. It’s an entrance that totally works for Bloom, popular star of “The Lord of the Rings” and “Pirates of the Caribbean” franchises. The actor was on his own bike the first time he met Leveaux. Rashad, often barefoot, plays Juliet as a portrait of innocence and naivete, with eyes that widen in Bloom’s presence. Bloom has all the right moves, with low-slung jeans ripped at the knees and a henley, unbuttoned underneath a hoodie. The purple briefs he displays with every stretch, leap or barely clothed descent from a “balcony” -- here, it’s a plank, suspended from the ceiling, stretching across nearly one-third of the stage -- have won their own Twitter feed. There is chemistry here, though for me it seemed to peak early on, when Bloom seduces Rashad with a kiss that lasted long enough for one nearby audience member to invoke Austin Powers: “Yeaahhhhh, baby.” During the famous balcony scene, I confess I began to wonder if this all might just be about hormones. The debonair, at-ease Bloom seems to overpower Rashad from here out. Blame it on the strategic wielding of a sun tattoo on his stomach ... or his nuanced performance. The age thing turns out to be not such a big deal, though you may find yourself tsk-tsking and thinking these oldsters ought to know that broken hearts eventually heal. Really, you two? Poison? I was more concerned by my creeping feeling that Rashad’s Juliet was better matched to Paris (Justin Guarini, the “American Idol” vet, restrained and charismatic), which would have pleased mom and dad to no end. As Lord Capulet, Chuck Cooper (Cy Coleman’s “The Life) is in full command of the bard’s poetry, with nearly every monologue a lyrical sermon. Roslyn Ruff (“Fences”) is fierce as a Lady Capulet more inclined to an eye-for-an-eye than her pacifist husband. Christian Camargo’s Mercutio is a swarthy instigator, Mick Jagger removed to the side of the Montagues, but his crotch-grabbing -- entertaining though it may be -- seemed out of place in this rich and dignified setting, with its earth-tone costumes and flattering lighting. Though race is a casting gimmick to distinguish this “Romeo and Juliet” from predecessors (this marks the tragedy’s first Broadway appearance in 36 years), it plays little part otherwise. It’s certainly not a reason, here, for animosity between the two families. The only time I was aware of black and white was in the presence of the always-awesome Jayne Houdyshell (“Dead Accounts,” most recently), as the nurse employed in servitude to the Capulets. How often, at least on Broadway, do we see a dowdy white woman working for a wealthy black couple? Returning home to her charge with favorable news of Romeo’s affections, Houdyshell’s nurse overhears Juliet complaining about her long absence: “Had she affections and warm youthful blood, she would be as swift in motion as a ball,” the waif complains. Well, Nurse Jayne won’t have any of that. Burned, she draws out Juliet’s curiosity, slowing time to a crawl as she rifles through her purse, pulling out breath mints, aspirin -- then a flask -- then fishing for a back rub, all until the lovestruck teen is ready to burst. The main feature of scenic designer Jesse Poleshuck’s set is a wall, partly inspired by “Juliet’s Wall” in present day Verona, Italy -- a landmark that attracts traveling couples who sign their initials, an act said to make their love everlasting. A dangling bell is distracting and sometimes in the actors’ way. Live musicians flanking the stage are a nice touch. Though there are moments when the tragic duo’s chemistry falters and things cool down, you’re advised to take a fashion cue from Brent Carver’s linen-clad, yogi-like Friar Laurence should you attend: wear breathable fibers, and just to be safe, bring a fan. “Romeo and Juliet,” at the Richard Rodgers Theatre, 226 W. 46th St., through Jan. 12, 2014. Tickets: $88.75-$146.75. Call 800-745-3000, or visit Ticketmaster.com.